This book, the latest in the Seminar Studies in History series, examines the movement to abolish slavery in the US, from the origins of the movement in the eighteenth century through to the Civil War and the abolition of slavery in 1865. Books in this Seminar Studies in History series bridge the gap between textbook and specialist survey and consists of a brief "Introduction" and/or "Background" to the subject, valuable in bringing the reader up-to-speed on the area being examined, followed by a substantial and authoritative section of "Analysis" focusing on the main themes and issues. There is a succinct "Assessment" of the subject, a generous selection of "Documents" and a detailed bibliography. Stanley Harrold provides an accessible introduction to the subject, synthesizing the enormous amount of literature on the topic. 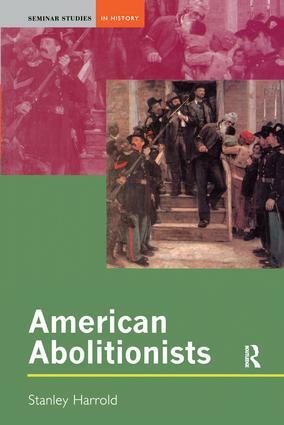 American Abolitionists explores "the roles of slaves and free blacks in the movement, the importance of empathy among antislavery whites for the suffering slaves, and the impact of abolitionism upon the sectional struggle between the North and the South". Within a basic chronological framework the author also considers more general themes such as black abolitionists, feminism, and anti-slavery violence. For readers interested in American history. Stanley Harrold is Professor of History at South Carolina State University and author of The Abolitionists and the South. Each book in the Seminar Studies series provides a concise and reliable introduction to a wide range of complex historical events and debates, covering topics in British, European, US and world history from the early modern period to the present day. Written by acknowledged experts and including supporting material such as extracts from historical documents, chronologies, glossaries, guides to key figures and further reading suggestions, Seminar Studies titles are essential reading for students of history.